Travelers flying out of Dallas can choose from two airports: Dallas Love Field and Dallas/Fort Worth International Airport. Orbitz.com makes it easy to locate low-fare flights from Dallas to numerous locations. DFW International Airport is situated between Fort Worth and Dallas. The airport is served by several airlines, including Alaska Airlines, American Airlines, Delta Air Lines, SkyWest Airlines, JetBlue Airways, Korean Air, Lufthansa, United Express, US Airways, and Virgin America. Love Field is situated approximately six miles northwest of the downtown area. Airlines serving Love Field include SeaPort Airlines, Southwest Airlines, United Express, and Delta Connection. Long-term and short-term parking is available at Love Field Airport. Rates for short-term parking begin at $3.00 per hour, and rates for long-term parking begin at $2.00 per hour. Terminal parking is available at DFW at a rate of $19.00 per day, while car-to-gate shuttle express parking is available at a rate of $10.00 per day for uncovered parking and $12.00 per day for covered parking. Economy parking is available at $8.00 per day. Taxi service is available from DFW International at a $17.00 minimum charge for trips outside the airport parking areas. A $40.00 flat rate is charged for locations within the central Dallas business district. The flat rate for destinations within the Fort Worth central business district is $43.00. Taxi services are also available at Love Field. Ground transportation is available at both Love Field and DFW International via the Dallas Area Rapid Transit system. 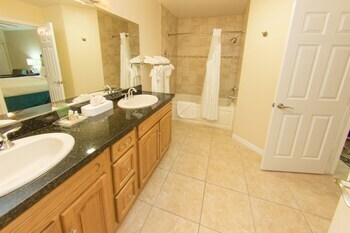 In addition, travelers can take advantage of the opportunity to book car rental services in advance through Orbitz.com. A variety of dining options are available at Love Field Airport, including Chili's Too, Cinnabon, McDonald's, Pizza Hut Express, and Starbucks. Travelers flying out of DFW International can also take advantage of dozens of restaurant choices for breakfast or a quick meal, including Dunkin Donuts, Starbucks, Jazzman's CafÃ©, and Cereality for a quick breakfast or coffee. When you use the travel planning tool at Orbitz.com, it is easy to find low-fare flights from Dallas. 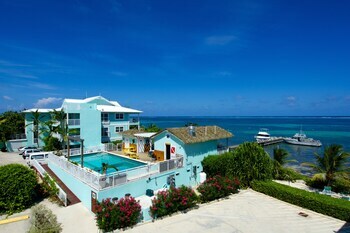 If you're looking for a bargain on flights to Grand Cayman Island, Orbitz.com can help you. The website searches flights from numerous airlines so that you can choose tickets that fit your budget. The Owen Roberts International Airport is the main international airport for the Cayman Islands. It's located on Grand Cayman Island-the largest of the three islands-on Roberts Drive, approximately one mile from the center of George Town. Eleven airlines service the airport, including United Airlines, Delta Air Lines, Cayman Airways and American Airlines. Taxicabs are available at the airport on a first-come, first-served basis. Cab fare ranges from $12 to $70, depending on what part of Grand Cayman Island you're visiting. Cab fare into George Town averages between $15 and $18. Limousines and buses also transport passengers from the airport, but they require reservations. If you want access to your own vehicle, you can purchase a vacation package that includes car rental and flight from Orbtiz.com. Even though the temperatures in the Grand Cayman Islands range from the low 70s to the low 90s all year long, the weather determines the peak travel season. The off-peak travel season runs from May to November, because the islands have more rainfall during this time. If you use Orbitz.com to book your trip during the off-peak season, you'll save money on your travel expenses. The Cayman Motor Museum, Dolphin Cove, Kittiwake Shipwreck & Artificial Reef and Seven Mile Beach are some of the top tourist attractions on Grand Cayman Island. 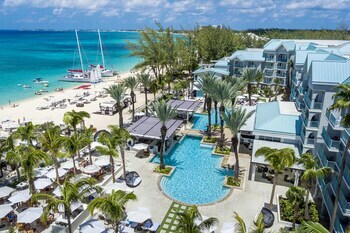 In addition to finding flights to Grand Cayman Island, Orbitz.com can help you purchase tickets to local attractions and arrange guided tours. Dallas-Fort Worth Intl. - Owen Roberts Intl. Explore Grand Cayman with Orbitz's Travel Guides to find the best flights, cars, vacation packages and more!